Sears has new promo codes to help with your Christmas shopping! Save up to $50 off with the promo codes below! 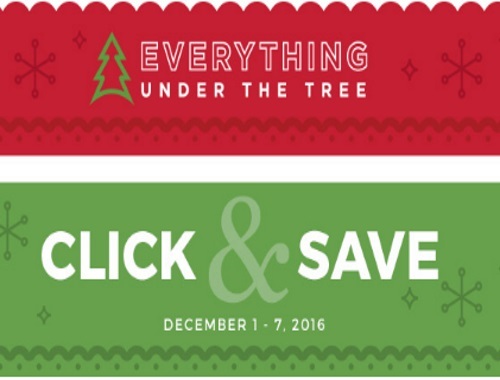 Offer valid only on qualifying sale-, clearance-, and regular- priced items purchased from December 1–7, 2016. Excludes items with prices ending in .91, .88, .94 and .97, cosmetics, fragrances, and grooming items, major appliances (except vacuums, sewing, and heating & cooling items), Dyson, Miele, iRobot, Nespresso, Keurig, Magic Bullet, SodaStream, Gladiator, Panasonic, garage door openers, patio furniture & barbecues, seasonal items, toys, nursery items, Gift Card purchases, deferral or installment billing fees, protection agreements, delivery, installation and maintenance charges. Not negotiable, transferable or redeemable for cash. On approved credit. One coupon per purchase; cannot be combined with Daily Deals or any other coupons or discounts. Click here to shop Sears.